Markets fall on cautious trade . The benchmarking indices ended lower on Wednesday, for the straight day, amid tepid September quarter earnings and Fed meeting to take stock of the US economy. Also Bihar polls weigh on sentiment as investor turned cautious. Mumbai: The benchmarking indices ended lower on Wednesday, for the straight day, amid tepid September quarter earnings and Fed meeting to take stock of the US economy. Also Bihar polls weigh on sentiment as investor turned cautious. However, the market analysts feel that the markets distained for growth once the government shows its resolve for structural reforms. Markets witnessed severe selling pressure on the select counters from banks, auto and pharma sectors. 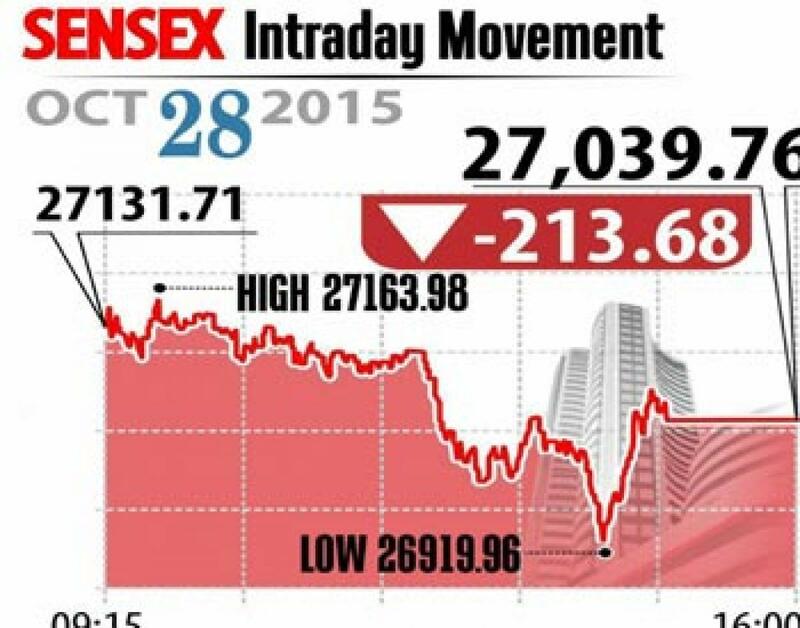 Sensex closed 214 points down at 27,040 and Nifty lower 62 points at 8,171. Meanwhile, broader markets outperformed their larger peers with midcap fell 0.5 per cent and smallcap closed flat. On sectoral front, banking index fell by 2.5 per cent followed by realty down by 1.2 per cent. On the other hand, consumer durables index ended gaining by 1.6 per cent. On the bank space, Axis Bank reported big loss as the stock plunged 7.3 per cent, followed by other banks like SBI, ICICI Bank and HDFC ended up to 4.5 per cent, each. Other heavyweights reported losses include Lupin down 2 per cent. While Vedanta gained 0.2 per cent as the company announced fall in the net debt, Tata Motors advanced 0.7 per cent as the company reported 21 per cent raise in its global sales. ONGC gained 0.5 per cent as it announced raise in its capex by 10 per cent next year. The gainers: Cipla, up 1.64 per cent at Rs 695.55; Bharti Airtel, up 1.62 per cent at Rs 358; ONGC, up 1.41 per cent at Rs 251.60; and Tata Motors, up 0.74 per cent at Rs 386. The losers: Axis Bank, down 7.36 per cent at Rs 482.95; ICICI Bank, down 4.30 per cent at Rs 271.50; State Bank of India, down 2.67 per cent at Rs 242; and NTPC, down 2.19 per cent at Rs 129.55.